Let your recipient choose their unique and delicious gift. We will email you the gift certificate which you can forward to your recipient, along with your gift message. The gift certificate is valid for seven years. Can’t decide? Let your recipient choose their own gift from our wide range of leases, gift baskets, & food items. 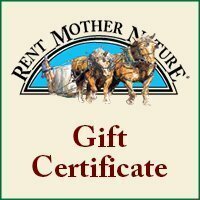 My brother bought me a gift certificate for my birthday from Rent Mother Nature. I had never heard of your company and was so excited to see so many choices from a really cool gift. I had some difficulty in utilizing the gift certificate online so I reached out via phone. I was greeted by a very friendly and helpful voice who had me up and ordering in minutes! I selected to rent a cow! I received my cheddar cheese in November and was blessed to be able to share it with friends and family over the holidays. It was DELICIOUS! Not only was this gift cool, but I love the way it supports local farmers: and the quality of the product and the customer service was perfection on top of it. Thank you to everyone at Rent Mother Nature, and to my brother Bob, for one of the most awesome birthday gifts ever! This experience made my birthday WONDERFUL!